Worship at Northminster is dynamic, inspiring, reflective, and welcoming! It is family-friendly and intergenerational. The Sacrament of Communion is on the 1st Sunday of every month; All are invited to the table! There are refreshments and social time in the sanctuary following worship. At Northminster, we encourage you to come as you are. Like to dress up for Sunday Worship? Great! Is dressing casual more your thing? Awesome! We are an open, welcoming community that celebrates individuality. Join us as you are. Parents are welcome to leave infants and children under 3 years in the Nursery with our hired caregiver during he service. A rocking chair is available in the back of the worship area for the comfort of parents who wish to remain in the sanctuary with an infant. Children are also welcome to remain in worship. There is a card table along the back wall near the entrance for children’s resources to use during worship. Music has always been a central part of our church's worship and community. Northminster has always been blessed with many talented musicians that allow us to be creative in our worship. Chant, Renaissance, Classical, early American music, world music, and classical contemporary music for worship. 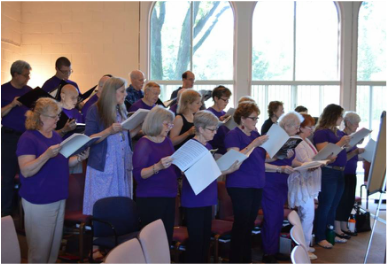 Currently, our musical ensembles include Northminster Choir, Northminster Bells, and Praise Pals, our children's bell choir and is led by Dr. Brandon Ulrich. Click here for more detail on our musical offerings. All are welcome to become involved in making music!